What to Do About A.J. Burnett? 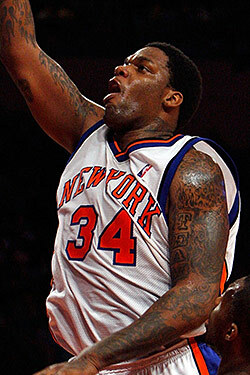 There are two Eddy Curry stories in the news today. One is that he'll miss four-to-six weeks with a strained right hamstring. (Adjust your fantasy draft plans accordingly.) And the other is that Curry says that he did not sabotage the Knicks' chances at signing LeBron James, presumably in response to the question, "Eddy, did you sabotage the Knicks' chances at signing LeBron James?" The News asked the question, and Curry says that the idea that he badmouthed the Knicks to James when the two met twice in advance of July 1 is "pure bull," adding, "Why would I do that?" We could think of a couple reasons, but we also wouldn't blame Curry for sharing them, had LeBron wanted him to.